The crown of King Eric XIV. The Crown of King Eric XIV of Sweden was made in Stockholm in 1561 by Flemish goldsmith Cornelius ver Weiden, for the coronation of king Eric XIV. It is held in the Treasury under the Stockholm Palace along with the rest of the Swedish Royal Regalia. The crown is the official crown of the King of Sweden, and is still used in ceremonies. Charles XV & IV also Carl ; Swedish: Karl XV and Norwegian: Karl IV was King of Sweden and Norway from 1859 until his death. Though known as King Charles XV in Sweden, he was actually the ninth Swedish king by that name, as his predecessor Charles IX had adopted a numeral according to a fictitious history of Sweden. The Early Vasa era is a period that in Swedish and Finnish history lasted between 1523–1611. It began with the reconquest of Stockholm by Gustav Vasa and his men from the Danes in 1523, Which was triggered by the event known as the Stockholm Bloodbath in 1520, and then was followed up by Sweden's secession from the Kalmar Union, and continued with the reign of Gustav's sons Eric XIV, John III, John's son Sigismund, and finally Gustav's youngest son Charles IX. The era was followed by a period commonly referred to as the Swedish Empire, or Stormaktstiden in Swedish, which means “Era Of Great Power”. 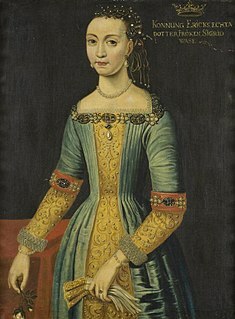 Karin Månsdotter was Queen of Sweden, first a mistress and then, for a few months in 1568, the consort of Eric XIV of Sweden. Catherine Jagiellon was a Polish princess and the wife of John III of Sweden. As such, she was Duchess of Finland (1562–83), Queen of Sweden (1569–83) and Grand Princess of Finland (1581–83). Catherine had significant influence over state affairs during the reign of her spouse, and negotiated with the pope to introduce a counter reformation in Sweden. Eric "X" was the King of Sweden between 1208 and 1216. Also known as Eric the Survivor, he was, at his accession to the throne, the only remaining son of King Canute I of Sweden and his queen. The name of his mother is not known, but may have been Cecilia. 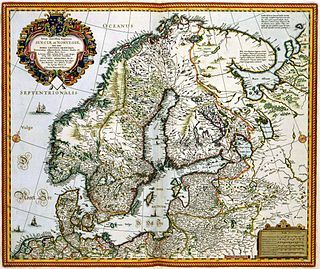 The Northern Seven Years' War was fought between the Kingdom of Sweden and a coalition of Denmark–Norway, Lübeck and Poland between 1563 and 1570. The war was motivated by the dissatisfaction of King Frederick II of Denmark with the dissolution of the Kalmar Union, and the will of King Eric XIV of Sweden to break Denmark's dominating position. The fighting continued until both armies had been exhausted, and many men died. The resulting Treaty of Stettin was a stalemate, with neither party gaining any new territory. Gripsholm Castle is a castle in Mariefred, Södermanland, Sweden. It is located by lake Mälaren in south central Sweden, in the municipality of Strängnäs, about 60 km west of Stockholm. Since Gustav Vasa, Gripsholm has belonged to the Swedish Royal Family and was used as one of their residences until the 18th-century. It is now a museum, but it is still considered to be a palace at the disposal of the King and as such it is part of the Crown palaces in Sweden. Sigrid Eriksdotter of Sweden was a Swedish princess, the legitimized daughter of King Eric XIV of Sweden and of his lover, later spouse and queen, Karin Månsdotter. 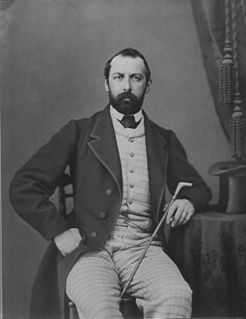 Gustav was a Swedish prince, the son of Eric XIV and Karin Månsdotter. Several Swedish coronation robes from the 16th to the 19th century are preserved at The Royal Armoury in Stockholm, Sweden. The youngest one, Oscar II's robe coronation robe from 1873 is in the Treasury at Stockholm Palace.